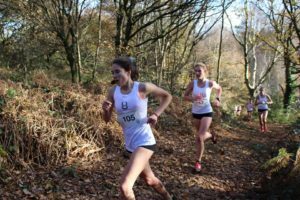 For many members of CUH&H, Saturday 25th November was to be the culmination of a full term of training, with the annual cross country varsity for the seconds to fourths teams. This year taking place on the hills of Shotover, the two buses needed to transport the Cambridge contingent left for Oxford at 8 am. The first race of the day was the women’s second team, taking on a 5.6 km course over the hills. Mary Butler put in a strong finish to take second, with only 2 seconds separating her from the two dark blues behind. Becca Frake and Phillippa Chambers ran well to finish 6th and 7th, leaving a pack of dark blues in their wake. However, this pack of Oxford runners from 7th to 10th pushed Megan Humphreys and Hope Bretscher into 11th and 12th to complete the scoring team, with Oxford taking the win 23 to 36. After the women’s IIs, the next two races of the day were the men’s IIs and IIIs, both over a two-lap, 8.2km course, with the IIIs set off five minutes after the IIs. The men’s IIs match carried a lot of anticipation, with a very strong Cambridge team facing off against a dark blue team containing multiple blues. The race set off, and with James Coxon taking the lead, and then setting the pace for a significant part of the race. The front pack stayed together for most of the race, before finally breaking up on the large hill on the second lap, with Norman Shreeve outkicking two dark blues to secure 1st. James Coxon was just pipped to the line to take 4th, closely followed by Paul Pruzina in 5th. Good packing by Oxford meant that despite strong runs from David Buglass, Eliot Nevill and Tom Goulding to finish the scoring team, Oxford took the team win with a very narrow margin of 37 to 42. 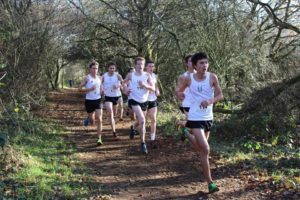 Meanwhile, the men’s IIIs race was also going on, with last-minute call-up Luke Fisher, having only just recovered from an injury, storming away from the field on the second lap to take a convincing individual win. Not too far behind, an outstanding run by Joshua Harris brought him home in 3rd, closely followed by James Taylor and James Nutt in 4th and 5th. The scoring team was completed by Lawrence Hollom and Luke McCarron in 10th and 11th. With the final Oxford scorer pushed into 13th by James Ackland, Cambridge took a convincing win, scoring 34 to Oxford’s 45. The women’s mob match was up next, with 16 Cambridge runners taking on the Oxford team over the 5.6km course. Strong runs from Ella Whitts, Amy Radford, Jade Harding, Maybritt Schillinger and Hannah Morton put them in the top 10, but through good packing and sheer weight of numbers giving a large advantage in the mob match scoring system, Oxford took the win 252 to 418.
through the field, and after the dust settled, Oxford took the win 828 to 973, a very respectable performance by Cambridge among mob matches, which are notoriously difficult to win as an away team. The result of the day was a 4-1 victory for Oxford. This result was not the one we hoped for, and indeed does not reflect the quality of the Cambridge teams, narrowly missing winds in both the men’s IIs and IVs matches.